The file, which was reported by a program on state television Monday night, contains a military court’s investigation at the time with evidence that Mr. Allende may have been shot from a small firearm before he shot himself with a machine gun from under his chin, as witnesses in the presidential palace have testified for almost 40 years. … Senator Isabel Allende, the former president’s daughter, stated that the program was “an insult to scientific intelligence.” “We are searching for the truth … but we want that truth to be based on scientific proof, not on journalistic imagination, not on irresponsibility,” she said. 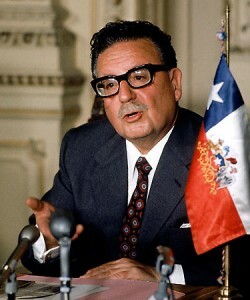 Judge Mario Carroza has been investigating the cause of Mr. Allende’s death since January. His remains were exhumed on May 23 and a team of Chilean and foreign forensics experts are expected to issue their conclusions within 90 days.